I decided I felt like a Sauvignon Blanc this evening, and since I had the Ascension one in the fridge it lucked out. In fact I lucked out too, since it is a nice drop. This is a beautiful pale straw coloured wine that, as its name suggests, is strong in passion fruit flavour and a refreshing change from the predominant gooseberry flavour of New Zealand Sauvignon. There is still a touch of acid present that nicely balances the wine. To the nose, it has a hint of kerosene and alcohol but it is not overpowering. I j ust opened a lovely Pegasus Bay 2002 Pinot Noir from the Waipara Valley in New Zealand. I haven't got to the Waipara Valley yet, but when I do this will be one vineyard I will definitely go to. This wine has a magnificent toast and dark cherry aroma. Echoing the aroma, this wine has a lovely warming, fruity full mouth feel that is not shy of hanging around for a long time. The colour is a very deep red, almost verging on light brown colour. This is drinking beautifully now but has the structure to support several more years of cellaring. 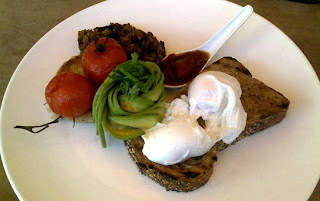 Last weekend Jane and I went out to the Takapuna Beach Cafe for brunch and had an enjoyable experience. Jane had been here previously and hadn’t had a great time, but we decided we would give it another go. This cafe has an excellent vista however the space between tables is too cramped. I had the Moroccan Eggs which were reasonably good, although not the largest of portions. Jane enjoyed a Butternut and Halloumi Salad although found it a bit unexpected to have two very large sections of butternut on the plate. Coffees were excellent as was the Coconut & Lime (I think) Smoothie I had. As for service, the menus were dirty, but the food and drinks all arrived very quickly. About two weeks ago I went to Arashi Kushiyaki (41 Courtenay Place, Wellington) midweek for a meal with my parents. This was my first time here. We ordered three of the Set menus and found this to be a decent amount of food at an appropriate price. The quality of japanese was pretty good although I have had better teriyaki chicken elsewhere. The service was noticeably slow, inattentive and there was a lack of enthusiasm from the staff. Simon has wisely suggested that some of my recent posts are better suited for my nztebs blog, my tech/professional/personal development blog rather than here on our family/leisure blog or over at unplain-Jane which is of course my creative blog. So many blogs. Anyway, the list of relocated entries is below with links to their new home. This is a big wine from Matakana (an hour north of Auckland) and one that we should really have consumed about 12-18 months ago and not in June 2009. We have previously really enjoyed this wine, however it has now turned to being a touch acidic and the alcohol and French oak is now starting to overpower the fruit. It is still quite drinkable but if you still have any of this vintage I suggest, unless you have great cellaring conditions, you drink it now. For the last few weeks, Simon has been enjoying teasing me about where he had booked for my birthday dinner tonight. I had a short list of suspected locations, but, as I found out literally once we got outside the restaurant, I was completely wrong on all counts! Simon would have had me believe he had booked us in for McDonald's - asking me if I like happy meals and whether I'd prefer fries or salad. But no, he had booked us in at Meredith's on Dominion Road. So yes, absolute top marks to Simon for booking a beautiful restaurant for dinner and for keeping it secret for so long! He thought I'd worked it out a couple of times, but no, I had no idea. We had a beautiful meal in a lovely setting, with polished but not stuffy service - which I sincerely appreciate. My entree was a taste sensation that I could happily live through again - Tuna with Abalone (aka Paua), Crab, Mirin and Mustard. The menu was on all counts somewhat enigmatic - which made a nice change from the current tradition of detailing every single item in a dish on the menu. Much was left to surprise - for example - the mustard was in fact a mustard sorbet. And I believe it was also dressed with a wasabi caviar and puffed rice (although not puffed like rice-bubbles!!!!). The mirin was lovely and the combination of flavours delicious. I had a glass of Simmonet Chablis with this - a great match and a lovely wine. Simon had a crayfish entree which I couldn't begin to tell you about. Perhaps he'll share later. For my main I had the Poussin which was served with a Paprika foam, a cauliflower puree (really really good) and baby leeks. Ooh, and scallops. How could I forget! I wasn't entirely fussed on the paprika foam, I felt it detracted a little from the rest of the dish, but I just moved it aside once I'd decided that and enjoyed the dish without it. The puree was my favourite part of this dish. I had a glass of Envoy Chardonnay - I am not usually a chardonnay fan, particularly when it is wooded, but this was delicious and a wonderful match. Thanks to our server for this recommendation. Simon had the market fish, which by all accounts was really good. Dessert. Ah yes, the enigmatic and fascinating menu continues! This time, Nachos. Yes, a dessert entry titled simply, "Nachos". I had to have it. 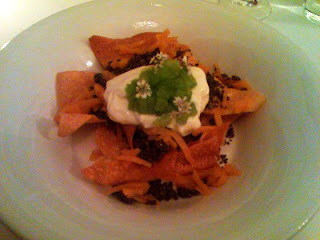 :-) Corn chips with chocolate mince, apricot melted cheese, yoghurt sour cream and, hmm, not sure what the guacamole was come to think of it. But as you can hopefully see from my sketchy camera-phone photo below, it was convincingly nacho like! And yes, it was really tasty! Very novel, but tasty too! Ooh, and in fine form, yes I had a glass of dessert wine with this - a Hunters 2007 Riesling - beautiful and light and luscious and hintingly flowery, without being coying or syrupy - a delightfully balanced sticky. Simon had a white chocolate tube with 'liquid mango', melon and a variety of other delectable morsels. All in all, a wonderful birthday dinner, great food, lovely wine, excellent service and of course marvellous company! Thanks honey!